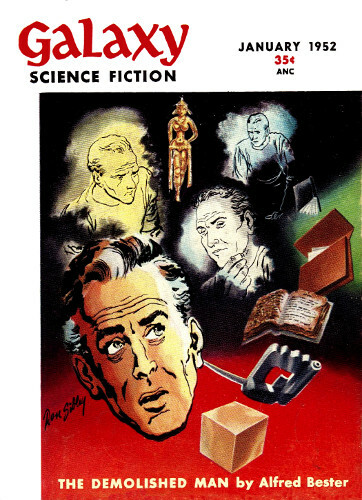 Galaxy Science Fiction January 1952.
bad habits, even on lonely asteroids! You must understand that Palmer loved his wife as much as ever, or he would never have thought of his simple little scheme at all. It was entirely for her own good, as he had told himself a dozen times in the past day. And with that he stilled whatever qualms of conscience he might otherwise have had. He didn't think of himself as being something of a murderer. She was sitting at the artificial fireplace, a cheerful relic of ancient days, reading just as peacefully as if she had been back home on Mars, instead of on this desolate outpost of space. She had adjusted quickly to the loneliness and the strangeness of this life—to the absence of friends, the need for conserving air, the strange feeling of an artificial gravity that varied slightly at the whim of impurities in the station fuel. To everything, in fact, but her husband. She seemed to sense his eyes on her, for she looked up and smiled. "Feeling all right, dear?" she asked. "As well as can be expected." She didn't reply, and he thought, She hates to admit it, but she really envies me. Well, I'll fix it so that she needn't any more. And he stared through the thick, transparent metal window at the beauty of the stars, their light undimmed by dust or atmosphere. The stories told about the wretchedness of the lighthouse keepers who lived on asteroids didn't apply at all to this particular bit of cosmic rock. Life here had been wonderful, incredibly satisfying. At least it had been that way for him. And now it would be the same way for his wife as well. He would have denied it hotly if you had accused him of finding her repulsive. But to certain drunks, the sober man or woman is an offense, and Palmer was much more than a drunk. He was a marak addict, and in the eyes of the marak fiends, all things and all people were wonderful, except those who did not share their taste for the drug. The latter were miserable, depraved creatures, practically subhuman. Of course that was not the way most of them put it. Certainly it was not the way Palmer did. He regarded his wife, he told himself, as an unfortunate individual whom he loved very much, one whom it was his duty to make happy. That her new-found happiness would also hasten her death was merely an unfortunate coincidence. She was sure to die anyway, before long, so why not have her live out her last days in the peace and contentment that only marak could bring? Louise herself would have had an answer to that, if he had ever put the question to her. He was careful never to do so. She laid the book aside and looked up at him again. She said, "Jim, darling, do you think you could get the television set working again?" "Not without a mesotron rectifier." "Even the radio would be a comfort." "It wouldn't do any good, any way. Too much static from both Mars and Earth this time of year." That was the beauty of the marak, he thought. It changed his mood, and left him calm and in full command of his faculties, able to handle any problem that came up. He himself, of course, missed neither the radio nor the television, and he never touched the fine library of micro-books. He didn't need them. A shadow flitted by outside the thick window, blotting out for a moment the blaze of stars. It was the shadow of death, as he knew, and he was able to smile even at that. Even death was wonderful. When it finally came, it would find him happy. He would not shudder away from it, as he saw Louise doing now at the sight of the ominous shadow. He smiled at his wife again, remembering the six years they had lived together. It had been a short married life, but—again the word suggested itself to him—a wonderful one. There had been only one quarrel of importance, in the second year, and after that they had got along perfectly. And then, two years ago, he had begun to take marak, and after that he couldn't have quarreled with anyone. It was a paragon among drugs, and it was one of the mysteries of his existence that anybody should object to his using it. Louise had tried to argue with him after she had found out, but he had turned every exchange of views into a peaceful discussion, which from his side, at least, was brimming over with good humor. He had even been good-humored when she tried to slip the antidote into his food. It was this attitude of his that had so often left her baffled and enraged, and he had a good chuckle out of that, too. Imagine a wife getting angry because her husband was too good-natured. But she was never going to get angry again. He would see to that. Not after tonight. A big change was going to take place in her life. She had picked up another book, and for the moment he pitied her. He knew that she wasn't interested in any books. She was merely restless, looking for something to do with herself, seeking some method of killing time before the shadows outside killed it for her for good and all. She couldn't understand his being so peaceful and contented, doing nothing at all. She threw the second book down and snarled—yes, that was the word, "You're such a fool, Jim! You sit there, smug and sure of yourself, your mind blank, just waiting—waiting for them to kill you and me. And you seem actually happy when I mention it." "I'm happy at anything and everything, dear." "At the thought of dying too?" "Living or dying—it doesn't make any difference. Whatever happens, I'm incapable of being unhappy." "If it weren't for the drug, we'd both live. You'd think of a way to kill them before they killed us." "There must be. You just can't think of it while the drug has you in its grip." "The drug doesn't have you, dear." He asked without sarcasm, "Why don't you think of a way?" "Because I lack the training you have. Because I don't have the scientific knowledge, and all the equipment scattered around means nothing to me." Her fists clenched. "If you weren't under the influence of the drug—"
"You know that it doesn't affect the ability to think. Tests have shown that." "Tests conducted by addicts themselves!" "The fact that they can conduct the tests should be proof enough that there's nothing wrong with their minds." "But there is!" she shouted. "I can see it in you. Oh, I know that you can still add and subtract, and you can draw lines under two words which mean the same thing, but that isn't really thinking. Real thinking means the ability to tackle real problems—hard problems that you can't handle merely with paper and pencil. It means having the incentive to use your brain for a long time at a stretch. And that's what the drug has ruined. It has taken away all your incentive." "I still go about my duties." "Not as well as you used to, and even at that, only because they've become a habit. Just as you talk to me, because I've become a habit. If you'd let me give you the antidote—"
He chuckled at the absurdity of her suggestion. Once an addict had been cured, he could not become addicted again. The antidote acted to produce a permanent immunization against the effects of the drug. It was the realization of this fact that made addicts fight so hard against any attempt to cure them. And she thought that she could convince him by argument! He said, "You talk of not being able to think!" "I know," she replied hotly. "I'm the one who blunders. I'm the fool, for arguing with you, when I realize that it's impossible to convince a marak addict." "That's it," he nodded, and chuckled again. But that wasn't quite it. For he was also chuckling at his plan. She had thought him unable to tackle a real problem. Well, he would tackle one tonight. Then she would simply adopt his point of view, and she would no longer be unhappy. After she had accepted the solution he had provided, she would wonder how she could ever have opposed him. He fell into one of his dozes and hardly noticed her glaring at him. When he came out of it at last, it was to hear her say, "We have to stay alive as long as possible. For the sake of the lighthouse." "Of course, my dear. I don't dispute that at all." "And the longer we stay alive, the more chance there is that some ship will pick us up." "Oh, no, there's no chance at all," he asserted cheerfully. "You know that as well as I do. No use deceiving yourself, my love." That, he observed to himself, was the way of non-addicts. They couldn't look facts in the face. They had to cling to a blind and silly optimism which no facts justified. He knew that there was no hope. He was able to review the facts calmly, judiciously, to see the inevitability of their dying—and to take pleasure even in that. He reviewed them for her now. "Let us see, sweetheart, whether I've lost my ability to analyze a situation. We're here with our pretty little lighthouse in the middle of a group of asteroids between Mars and Earth. Ships have been wrecked here, and our task is to prevent further wrecks. The lighthouse sends out a standard high-frequency beam whose intensity and phase permit astrogators to estimate their distance and direction from us. Ordinarily, there's nothing for us to do. But on the rare occasions when the beam fails—"
"That will be the end." 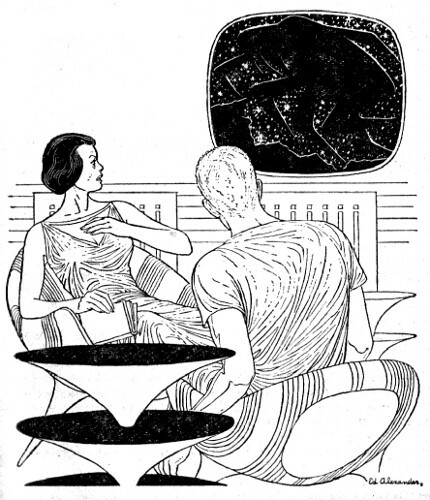 "On those occasions," he continued, unruffled by her interruption, "I am supposed to leave my cosy little shelter, so thoughtfully equipped with all the comforts of Earth or Mars, and make repairs as rapidly as possible. Under the usual conditions, lighthousekeeping is a boring task. In fact, it has been known to drive people insane. That's why it's generally assigned to happily married couples like us, who are accustomed to living quietly, without excitement." "And that," she added bitterly, "is why even happily married couples are usually relieved after one year." "But, darling," he said, his tone cheerful, "you mustn't blame anyone. Who would have expected that a maverick meteor would come at us and displace us from our orbit? And who would have expected that the meteor would have collided first with the outer asteroids, and picked up a cargo of—those?" He gestured toward the window, where a shadow had momentarily paused. By the light that shone through, he could see that the creature was relatively harmless-looking. It had what appeared to be a round, humorous face whose unhumorous intentions would be revealed only at the moment of the kill. The seeming face was actually featureless, for it was not a face at all. It had neither eyes, nor nose, nor mouth. The effect of features was given by the odd blend of colors. Almost escaping notice because of their unusual position and their dull brown hue were the stomach fangs, in neat rows which could be extended and retracted like those of a snake. He noticed that Louise had shuddered again, and said, in the manner of a man making conversation, "Interesting, aren't they? They're rock breathers, you know. They need very little oxygen, and they extract that from the silicates and other oxygen-containing compounds of the rock." "All right, if you don't want me to. But about us—you see, my dear, no one expected us to be lost. And even if the Lighthouse Service has started to look for us, it'll take a long time to find us." "We have food, water, air. If not for those beasts, we'd last until a rescue ship appeared." "But even a rescue ship wouldn't be able to reach us unless we kept the beam going. So far, we've been lucky. It's really functioned remarkably well. But sooner or later it'll go out of order, and then I'll have to go out and fix it. You agree to that, don't you, Louise, dear?" She nodded. She said quietly, "The beam must be kept in order." "That's when the creatures will get me," he said, almost with satisfaction. "I may kill one or two of them, although the way I feel toward everything, I hate to kill anything at all. But you know, sweetheart, that there are more than a dozen of them altogether, and it's clumsy shooting in a spacesuit at beasts which move as swiftly as they do." "And if you don't succeed in fixing what's wrong, if they get you—" She broke down suddenly and began to cry. He looked at her with compassion, and smoothed her hair. And yet, under the influence of the drug, he enjoyed even her crying. It was, as he never tired of repeating to himself and to her a wonderful drug. Under its spell, a man—or a woman—could really enjoy life. Tonight she would begin to enjoy life along with him. Their chronometer functioned perfectly, and they still regulated their living habits by it, using Greenwich Earth time. At seven in the evening they sat down to a fine meal. Knowing that tomorrow they might die, Louise had decided that tonight they would eat and drink as well as they could, and she had selected a Christmas special. She had merely to pull a lever, and the food had slid into the oven, to be cooked at once by an intense beam of high-frequency radiation. 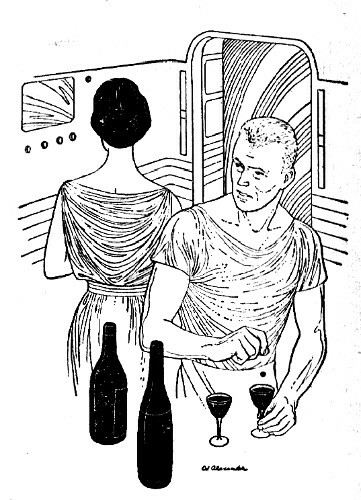 Jim himself had chosen the wine and the brandy—one of the peculiarities of the marak was that it did not affect the actual enjoyment of alcoholic drinks in the slightest, and one of the sights of the Solar System was to see an addict who was also drunk. But it was a rare sight, for the marak itself created such a pervading sensation of well-being that it often acted as a cure for alcoholism. Once an alcoholic had experienced its effect, he had no need to get drunk to forget his troubles. He enjoyed his troubles instead, and drank the alcohol for its own sake, for its ability to provide a slightly different sensation, and not for its ability to release him from an unhappy world. So tonight Palmer drank moderately, taking just enough, as it seemed to him, to stimulate his brain. And he did what he now realized he should have done long ago. Unobserved, he placed a tablet of marak in his own wineglass and one in Louise's. The slight bitterness of taste would be hardly perceptible. And after that Louise would be an addict too. That was the way the marak worked. There was nothing mysterious about the craving. It was simply that once you had experienced how delightful it was, you wouldn't do without it. The tablet he had taken that morning was losing its effect, but he felt so pleased at what he was doing that he didn't mind even that. For the next half hour he would enjoy himself simply by looking at Louise, and thinking that now at last they would be united again, no longer kept apart by her silly ideas about doing something to save themselves. And then the drug would take effect, and they would feel themselves lifted to the stars together, never to come down to this substitute for Earth again until the beam failed, and they went out together to make the repairs, and the shadows closed in on them. He had made sure that Louise had her back to him when he dropped the tablet into her glass, and he saw that she suspected nothing. She drank her wine, he noticed, without even commenting on the taste. He felt a sudden impulse to kiss her, and, somewhat to her surprise, he did so. Then he sat down again and went on with the dinner. An hour later he knew that he had made her happy. She was laughing as she hadn't laughed for a long time. She laughed at the humorous things he said, at the flattering way he raised his glass to her, even at what she saw through the window. Sometimes it seemed to him that she was laughing at nothing at all. He tried to think of how he had reacted the first time he had taken the drug. He hadn't been quite so aggressively cheerful, not quite so—hysterical. But then, the drug didn't have exactly the same effect on everyone. She wasn't as well balanced as he had been. The important thing was that she was happy. Curiously enough, he himself wasn't happy at all. It took about five seconds for the thought to become clear to him, five seconds in which he passed from dull amazement to an enraged and horrified comprehension. He sprang to his feet, overturning the table at which they still sat. And he saw that she wasn't surprised at all, that she still stared at him with a secret satisfaction. "You've cured me!" he cried. "You've fed me the antidote!" And he began to curse. He remembered the other time she had tried it, the time when he had been on the alert, and had easily detected the strange metallic taste of the stuff. He had spat it out, and under the influence of the drug from which she had hoped to save him, he had laughed at her. Now he was unable to laugh. He had been so intent on feeding the tablet to her that he had forgotten to guard himself, and he had been caught. He was normal now—her idea of being normal—and he would never again know the wonderful feeling the drug gave. He began to realize his situation on this horrible lonely asteroid. He cast a glance at the window and at what must be waiting outside, and it was his turn to shudder. He noticed that she was still smiling. He said bitterly, "You're the addict now and I'm cured." She stopped smiling and said quietly, "Jim, listen to me. You're wrong, completely wrong. I didn't give you the antidote, and you didn't give me the drug." "I put it in your wineglass myself." She shook her head. "That was a tablet I substituted for yours. It's an anti-virus dose from our medicine chest. You took one of the same things. That's why you feel so depressed. You're not under the influence of the drug any more." He took a deep breath. "But I'm not cured?" "No. I knew that I wouldn't be able to slip you the antidote. The taste is too strong. Later you'll be able to start taking the drug again. That is, if you want to, after experiencing for a time what it is to be normal. But not now. You have to keep your head clear. You have to think of something to save us." "But there's nothing to think of!" he shouted angrily. "I told you that the drug doesn't affect the intelligence!" "I still don't believe you. If you'd only exert yourself, use your mind—"
He said savagely, "I'm not going to bother. Give me those marak tablets." She backed away from him. "I thought you might want them. I took no chances. I threw them out." "Out there?" A horrified and incredulous look was on his face. "You mean that I'm stuck here without them? Louise, you fool, there's no help for us! The other way, at least, we'd have died happy. But now—"
He stared out the window. The shadows were there in full force. Not one now, but two, three—he counted half a dozen. It was almost as if they knew that the end had come. They had reason to be happy, he thought with despair. And perhaps— he shrank back from the thought, but it forced itself into his mind—perhaps, now that all happiness had gone, and wretchedness had taken its place, he might as well end everything. There would be no days to spend torturing himself in anticipation of a horrible death. Louise exclaimed suddenly, "Jim, look! They're frolicking!" He looked. The beasts certainly were gay. One of them leaped from the airless surface of the asteroid and sailed over its fellow. He had never seen them do that before. Usually they clung to the rocky surface. Another was spinning around oddly, as if it had lost its sense of balance. Louise said, "They've swallowed the tablets! Over a hundred doses—enough to drug every beast on the asteroid!" For a moment Palmer stared at the gamboling alien drug addicts. Then he put on his spacesuit and took his gun, and, without the slightest danger to himself, went out and shot them one by one. He noted, with a kind of grim envy, that they died happy.